Ethiopian Adoption Families~Together at last! One more day to enter giveaway!! Crazy Love for my Friends!! Status report and a celebratory GIVEAWAY!!!!! Since we began this process a year ago, God has been connecting us to others who are adopting or who have already adopted from Ethiopia and who live in the Tampa Bay area. Our little church adoption community has begun to connect with others in the area, and thanks to the initiative of the Hinrichs, we had our first official gathering together this past weekend! It was so fun to know we share a love for Jesus, for orphans, and for Ethiopia. We were even able to meet some of the Hinrichs' Ethiopian friends who live in the area--such a blessing! We visited, enjoyed good fellowship, ate great food, even swung from trees! : ) The adults were definitely outnumbered by the 22 kids present!! It's so wonderful to think of our children growing up together, in the same community. I think this is only the beginning of some wonderful friendships. Amy H noted later-- not once did we have to ask or answer the question, why adoption or why Ethiopia. We already know--we *get* each other--and it is a wonderful kinship. Here's some photos from our time together. can't wait to see Abby in this photo! Africa bound!! Court date & tentative travel dates! We have been out of town this week visiting family in Missouri. It has been wonderful. Today, we hit to road to drive the 19 hours back to Florida. I've been quiet this week in light of our travels, but I wanted to give you a quick report! We received news this week that our court date has been scheduled for November 19th! We are tentatively scheduled to travel November 17-20 (adding a day for travel on either side). It's here. An actual date! We are beyond excited. We thought we would have to wait until the courts reopened to even be given this date, but apparently not! How will we spend this trip? Well, for one, this will be Joe's first trip to Africa. There will not be much time for sightseeing on this trip, but for sure we will enjoy processing all we see together as a shared experience for the first time. We have been told we will get to meet Abby and spend some time with her each day we are there, so we assume November 18 will be our official "Meet-cha Day! ", where we will hug Abby and see her face to face for the first time. Our actual court date is November 19th, so on that day we will appear before a judge and express our desire to adopt Abby. Once we pass court, She is official ours! At that point, we will be able to post pictures of her for you to see. After that, we will return about 6 weeks later for a longer trip and our embassy appointment. When we return home from that trip, Abby will be with us. So that's the scoop for now. Time to go load up in my Suburban! I'll leave you with some photos from our trip this week. See ya on the flip side! Yea! 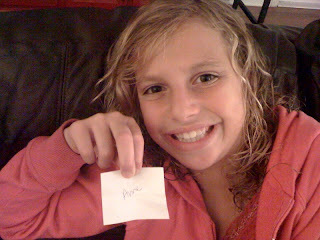 The girls and I drew a name for the winner of our 147 Million orphans giveaway! In her comment, Anne said..."I'm a new follower, new to CHI, new to blogging and excited to be making connections with others on this journey." How fun for her to win! Go stop by her new blog and let's give her a great big welcome to the adoption-blog-community!! Congrats, Anne! Email me with your address and your 147 goodies will be on their way! And thanks everyone for entering! It was fun to celebrate with all of you!! There's one more day to enter to win the 147 Million Orphans gear giveaway!! Winner will be announced tomorrow! Linny over at A Place Called Simplicity is sharing some CRAZY Love again! She is linking up folks who have a need on behalf of orphans with those who currently have the resources to help, and to pray. I love her heart to serve others, and to always stand up for the fatherless. Those of you visiting here from her blog, welcome!! So, sure, there are costs still ahead for us, but I wanted to return some of the CRAZY LOVE shown to me over the last couple of weeks, and instead of posting MY need, post the need of a couple of my friends who are adopting, as well as another orphan ministry I care about deeply. The Masers are wonderful friends, adopting a little boy from Ethiopia. They are $500 away from their need to submit their dossier. $500!! It's almost nothin'! And yet they can't finish their paperwork and get on the waiting list without it. Maybe you could help by participating in their puzzle fundraiser or by buying one of the beautiful necklaces she is selling. Either way, you would be helping a wonderful family bring home their son to a forever family. Go check out their blog here. 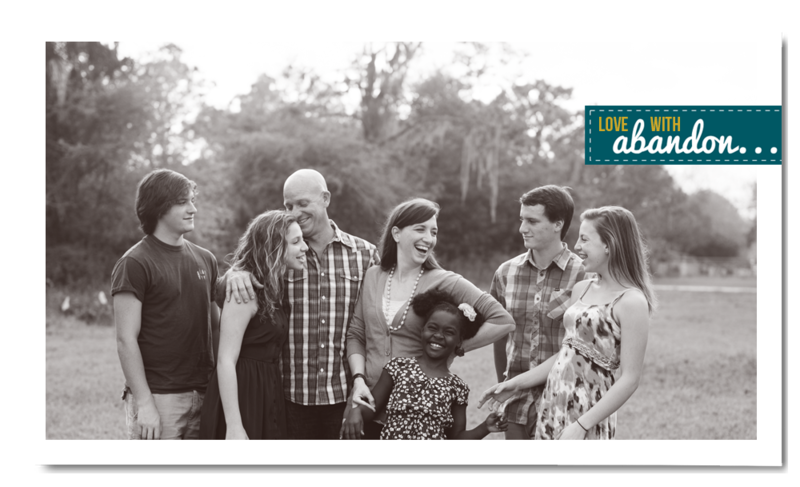 There is no one I know who encourages, loves, & supports adopting families more than my friend Erica. Having adopted once already, they are headed back to Ethiopia to bring home a little girl. 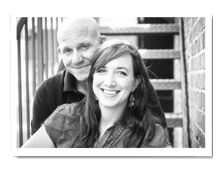 For the Shubins, speaking up on behalf of the fatherless is not optional or occasional: it is their calling and their passion, and their own adoption is one of many ways they do this. They are currently fundraising for their referral fee. 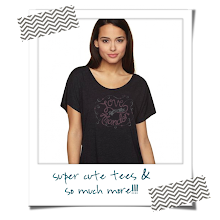 Erica is selling some DARN cute shirts, she's doing a puzzle fundraiser, AND Tracy over at Junk Posse is giving 30% of her sales to the Shubin's adoption fund. Head over to Erica's blog and check it out! And finally, I want to mention a great sponsorship program, helping some children I love in Ethiopia. Those of you who read this blog know last January I spent some time in Korah, with Sammy and those who live in the trash dump there. This ministry, Project 61, is sponsoring kids from the dump to go to school for $700 a year--amazing considering this pays for room & board, education, clothes, books...EVERYTHING they need. Go check it out and see if you might be able to help one of these children. Thanks for stopping by, and thank you Linny, for spreading some CRAZY LOVE today! Well, we officially mailed in our referral acceptance last Friday, ON TIME, with a FULL referral fee payment THANK YOU VERY MUCH!!! I thought this might be a good chance to recap and let you know what's ahead. Since we put our need out there exactly two weeks ago today, God has brought in a total of $10,804. WOW. That's our referral fee PLUS $2,669! I'd say we're well on our way to raising our funds for our travel expenses! Simply incredible. As I prepare to write all of those names on 500 puzzle pieces, I am blown away to think how many of you have been involved in my bringing my daughter home. How does someone say thank you for something like that?! Those two words just don't seem to express all I feel--how full my heart is with gratitude for you. I can't wait to tell Abby one day about all of you and the love you poured out on our family. Well, it just so happens that the timing of our referral has fallen on the exact weekend that the courts in Ethiopia have closed for two months. Their courts close during their rainy season, and will not reopen until September 27. We have to wait until the courts reopen to even be given a court date, which means we will not even know until October when our first trip will be. Our guess is that our court date could be late October but more likely will be in November. Then, we will prepare to travel approximately 6 weeks after that first trip to return to Ethiopia and bring Abby home (so that could be December or January). So...we wait. We cling to God's sovereignty and know His timing is perfect. We trust little Miss Abby to His perfect care until we can hold her in our arms ourselves. I am updating my thermometer to reflect our fundraising for our travel costs, which will be our next round of expenses. It is exciting to realize we are on our last round of fundraising needs! In the last year, God has provided close to $20,000! Really, all we have left is our travel costs for our two trips to Ethiopia and some post-adoption expenses with our homestudy agency. We have no reason to doubt that God will provide just what we need, when we need it. TIME TO CELEBRATE!! A GIVEAWAY!! We want to say thank you and celebrate all that God has done in the last few weeks!! 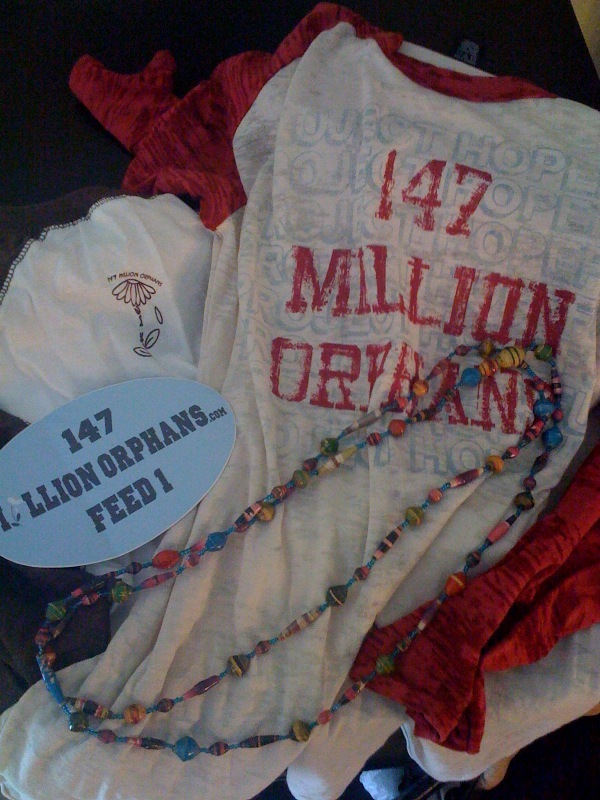 Thanks to Gwen and Suzanne, the gals at 147 Million Orphans, I have a fun packet of 147 goodies to giveaway!! Who doesn't LOVE some 147 gear??!!!! Leave me a comment here on my blog or on facebook so I know how you've entered. That's it!! This giveaway will run until Monday, August 16th at noon (EST). I'll announce the winner Monday. Enter today and everyday until Monday! And be sure and let me know when you do! What a whirlwind this last week has been! It was last Wednesday that we announced our referral and told you about little Abby Lynne. In one week, God has provided over $10,000. We are floored. Right now, I'm transferring PayPal funds, depositing checks, and putting everything together so we can send in our acceptance by the end of the week. It is so exciting!!!! My family is here from Texas; they arrived on Saturday, just in time to watch the Lord miraculously provide our referral goal!! It has been so fun to have them here to celebrate with us, and they are marveling at how the body of Christ and our friends and family are rallying to help bring Abby home. The last time we were able to really spend any time together was two years ago, so we are soaking it up and enjoying every moment. Having company has consumed most of our time, since we have been down at their condo every day, and so the girls are slacking in their puzzle assembly and I'm slacking in personal thank you's!! But know our hearts are full, and we will soon be posting our nearly completed puzzle!! (Even though we have hit $10,000, some people overpaid for their puzzle pieces, so we still have 28 pieces left!) We have a great head start on our travel expenses!! For now, I'll leave you with a few pictures. Hoping you're enjoying this last month of summer as much as we are!! Sometimes words fail. As I sit here trying to write this post, I'm just not sure even where to begin and how to say all that I'm feeling. I'm a little overwhelmed with emotion and alot short on words. We have met our referral fee goal. In 4 days. Our goal was $8300... as of now we have $8548. Again, no words. As I was typing our facebook update last night, we were at $6548... just under $2,000 from our goal. 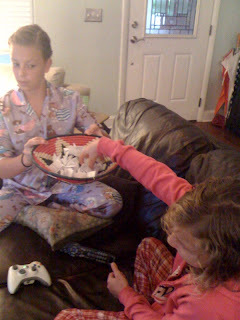 I was chatting on facebook with a friend, who told me she was emailing me some pictures and said to go check my email. So I posted my status, then went to check my email. I saw her pictures, and then saw another email had come in from someone I didn't know. She was another adopting mom, who had found my blog, and wanted to support our adoption. She said she and her husband just cut a check for $2,000 and would be sending it out right away. Seriously. What do you say to that?! Joe and the kids and I read her email in tears. We are amazed. In awe of the provision God has granted in such a short period of time. All of you have rallied behind our family and supported our efforts to bring home Abby in this hour of need. Some of you we know, many of you we don't. We feel so loved, and we are so grateful. We will now be able to send our referral packet by our due date. That is such a huge relief, to know we will not be delayed in getting our court date and planning our travel to meet our daughter. As for the puzzle...that puts us at 395 pieces sold. It is coming together!!! Those of you who still want to purchase a piece and be a part of that memorial may continue to do so. The puzzle is 500 pieces...so there's plenty more available. All funds at this point will go toward our next phase of expenses, which include our 2 required trips to Ethiopia, in country expenses, visas, etc. We still have about $10,000 more in expenses from here...so nothing is wasted, I assure you. But I don't want to leave this post on a note of need. Because frankly, in the last four days, God has proven He will fund what He favors. So I want to leave this post rejoicing, thanking my God for you, and celebrating the provision He has granted. All for little Abby. All for God's glory. and to bless all the work of your hands.